This is our last full day in Egypt. Tomorrow we'll be flying back to Germany. It's a bittersweet feeling. This has been such an intense experience, it feels in some ways we've been gone a year. But Peter's got a bad cold, and I think there isn't much more I can take in. It's time to go back home and resume our old life. But until then, we'll experience as much as we can today. At breakfast I see two women who couldn't be more different. One of them is a blonde - a European? She is accompanied by two men, and is wearing a very low-cut top showing much of her ample breasts. She is dressed in a very short skirt. My eyes feel almost assaulted by the sight. Is it more of this that we'll be going back to? At least it's winter, when people cover more of their bodies for warmth. I know I'm quite conservative about clothing. I don't wear low-cut tops in Germany, even though some of my Christian friends are very generous when it comes to offering glimpses of the upper parts of their bodies. I feel offended, but say nothing. We live in a free country, and I value freedom even more than modest attire. There is another woman who almost takes my breath away. Her beauty strikes me as something almost otherworldly, entirely different from that of Mohammed's archaeologist friend. Her eyes are large, open and warm. She moves with modesty and grace. She is dressed in a long, straight, brown and beige gown with a long matching scarf covering her head. She seems to float through the room. She has two handsome boys and a distinguished looking husband. The males are all dressed in Western casual attire. I noticed her yesterday, and longed to know at least where they come from. Today I muster up courage, despite Peter's protests about my invading their privacy. I walk up to their table, ask if they speak English, and they say yes. I tell her I love her clothes, and ask where they're from. "Pakistan," her husband says. When they have finished their meal, on their way out of the restaurant, the entire family walks up to us, shakes our hands and wishes us a good day. As I leave the hotel, I spontaneously decide to cover my head with my scarf. We buy some water for the day at a kiosk, and an Egyptian woman, also waiting to buy something, notices my scarf and smiles at me in approval. I like the feeling of having my head covered. I wouldn't want it forced on me, but I feel somehow more lady-like this way. We pass a mosque just before prayer time. A man stops me and says, "I know you have Egyptian blood, but you should wait until the service is over to go into the mosque." After a while, I let the scarf fall down to my shoulders again. I am touched in surprising ways as this by this culture, but I am still a Westerner. We take the Metro to Old Cairo. We know what we're doing now, and grin at each other because we have the same thought - we can get around Cairo on our own! We return to the Hanging Church, which we saw on Sunday. It is so beautiful, we want another look. This time we sit and meditate a while. A group of young people is practicing some worship songs back in another room somewhere. Despite the Arabic-style accompaniment, we recognize one of the songs as one we also sing. We feel united with them. We peek into St. Barbara, another of the oldest Coptic churches of Cairo. It has more of that beautiful woodwork which originated with the Copts. This technique uses a combination of ivory, ebony and bone as inlay for the wood. This technique was incorporated into Muslim art and later spread all over the Muslim world. We see the same woodwork in the oldest synagogue in Cairo, Ben Ezra, just a few steps away from St. Barbara. This synagogue, originally a church, was purchased in 882 A.D. by Abraham ibn Ezra of Jerusalem, and beautifully restored. Here we see more of the woodwork we've seen in the churches and mosques. According to tradition, this is the very spot Moses was supposed to have been found as a baby in a basket in the bulrushes. This symbolically significant location is practically next door to another one - the site, now the crypt of St. Sergius Church, where Mary and Joseph are said to have fled with baby Jesus. Ben Ezra was once an important synagogue for Cairo. Maimonedes, one of the most famous of Jews in history, worshipped here. Cairo had 60,000 Jewish inhabitants until 1947, when Jews began to be evicted en masse from Egypt. 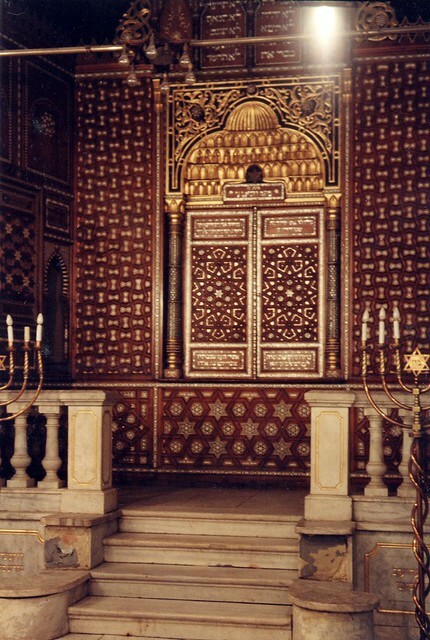 Now there are only about 100 Jews left in Cairo, and this synagogue is a museum. How sad! Cairo and Alexandria have had the same fate - losing that wonderful blend of cultures because people let their fear, prejudice, and excessive patriotism turn into hegemony. They are all the poorer for it. This country, as other Arab nations I have read about and Germany, which I know first-hand, has suffered from the consequences of bigotry and antisemitism. But, unlike in Germany, it seems as though the need to rise from hundreds of years of subjugation by countries such as Turkey, France and Britain, leaves no room for exploration of one's own part in a guilty past. Hubris leads to its own fall, and all that follows is impoverishment. We shop on the ancient "book mall" street, finding several excellent books in English, which we buy. There are also many in French and German. This is our last chance to buy books - the airport will only have the same old travel books. It's a good thing the books are covered in plastic - it's raining! A rare occurrance for Cairo. 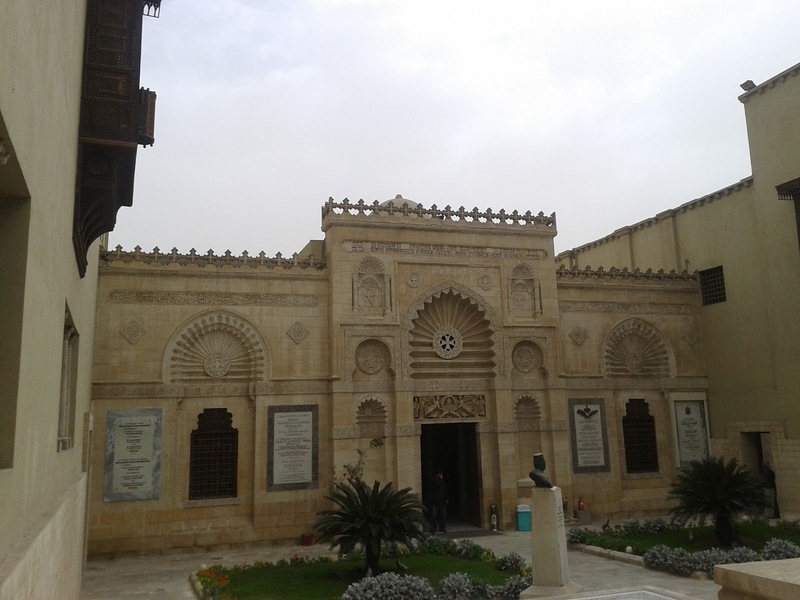 Our next stop is the Coptic Museum, also just a few steps away from the synagogue and the ancient Coptic churches of Cairo. The museum is interesting, but dimly lit, making it impossible to read some of the explanations of objects on display, but providing great atmosphere. The museum itself is the most beautiful building we have seen yet, and we've seen several amazing structures, all in this neighborhood. The oldest part of the building was built in 1908, so this is a "new" building, but has all the old architectural elements - gorgeous woodwork, carved wooden ceilings, stained glass windows and galleries looking down onto courtyards. We learn some interesting things about Christianity here. We learn that the transition to complete Christianity in Egypt was gradual. We see gravestones with both a cross and the ancient Egyptian god Anubis. There are lots of Greek mythological sculptures, sometimes mixed with ancient Egyptian motifs, and others with Christian symbols. The dominant religion of Egypt was Christian, from the time of the inception of the Church until about 900 AD, when Islam slowly took over. Now Egypt is 90% Muslim, with only 10% being Coptic. Since the revolution in January 2011, around 100,000 Copts have left Egypt. I wonder if the same thing will happen to them as happened to the Jews. I hope and pray not. We see one of the first ever bound books, from about 800 AD, I think. There are also some of the gnostic writings found in Nag Hamadi, on display. In the afternoon, on our way back to the hotel, Peter, weakened by his cold, really needs to eat. We walk by a fast-food restaurant. "Koshary Restaurant," it says. We have no idea what koshary is, but we decide to enter anyway, looking forward to an adventure. It turns out to be a concoction of two types of noodles, lentils, tomato sauce, topped with fried onions. It is spicy, a little bit vinegary, and delicious. It costs only about a euro to get full on this delicious meal. We rest for the rest of the afternoon, and then take a taxi to the restaurant where we will eat our last dinner in Cairo - at the Sabaya, the Lebanese restaurant in the Semiramis Hotel. Even before you walk inside, it is inviting, with decorated wrought iron lamps giving off a dim light. We each order a menu - fish for me and grilled meat for Peter. Everything is exquisite, absolutely beautiful to look at and delicious. I loved the cold karkadé tea, and could swear there is cardamom and cinnamon, maybe also cloves mixed in, but the manager says it is only the hibiscus. I get the feeling that Lebanese must be to the Arabic cuisine what the French is to the European. Egyptian food is similar to Lebanese, it appears, but the Lebanese seem to have a way of refining it all. We must go to Beirut some day and find out for ourselves. I am ecstatic about everything we eat, from the mezze to dessert. At the end of the meal, the manager brings us a treat - a Lebanese tea, which I think is heated rosewater, in lovely crystal cups with the metal handle at the bottom, like a tea glass. He's so pleased with my compliments, he asks if we could write an honest report of the meal. The only negative thing there is to say is that the waiter didn't ask which dessert we wanted, so in the end we got both kinds, including the mahalabiya, which I've been wanting to try. What a way to end our trip to Egypt! We end the evening with a romantic stroll on the bridge next to the Semiramis Hotel. We hear Arabic music in the distance. It's coming from one of those boats I read about in Coctails and Camels - we see the legs of dancers moving to the rhythm of the music. And ahead of us, a car is parked right on the bridge, slowing down the traffic. People do things like that in this crazy city. People stand next to the car, enjoying the Nile at night. Our last night on the Nile.